Today marks the beginning of Fashion Revolution Week. A week dedicated to bringing to light the awful effects of the fast fashion industry on garment workers. Each year this week takes place over the anniversary of the Rana Plaza collapse where 1,138 people died and another 2,500 were injured, making it the fourth largest industrial disaster in history. This week is about putting the garment workers back into our clothes, remembering that somebody made these items we wear and they most likely weren't paid properly for it. The fast fashion industry is not only destroying our planet but it is also destroying lives. Thousands of garment workers, mostly women, all over the world are forced to work long hours for little or often no pay. The rate at which clothes are now consumed means they have to be made quickly and cheaply leaving very little money for the people who actually make them. In Bangladesh, garment workers are campaigning to be paid the living wage, just £50 a month, but they do so at great cost to themselves and their families. It is not unusual to be sacked without any warning if you are seen to cause problems and often women are beaten and even arrested simply for asking for a basic human right. Many steps have been taken by brave garment workers who have set up unions and campaigned for equal rights, a living wage and compensation when a factory closes or there is an accident, but there is still so much more to do and a lot of it is down to us. Will we stand with these garment workers who ask for no more than just enough to survive? Will we allow ourselves to continue to be seduced by fast fashion? We all know that buying new cheap clothes will not make us happy once the tags are off, but it can be hard not to be seduced by advertising that promises a happier you if you only buy one more pair of jeans. We have to take control over this. We must learn that happiness does not come from a new pair of shoes or a dress. We must ask ourselves where these clothes I am buying have come from and who made them and if they only cost £5 how can that give a fair wage to the person who made them? We must choose to make more conscious decisions, to completely change our relationship to clothes and to learn to buy less and to buy better. Once we stop filling our wardrobes with hundreds of clothes we do not need the argument that Fairtrade fashion is unaffordable becomes irrelevant. If we buy only what we need and choose ethical, well made items that will last over cheap and quick we could all change millions of lives. So will you stand with garment workers? Will you ask the question who made my clothes to your favourite brands? Will you demand transparency in the supply chain? Will you buy less and better? We can all make a huge difference in this world simply by how we choose to spend our money. 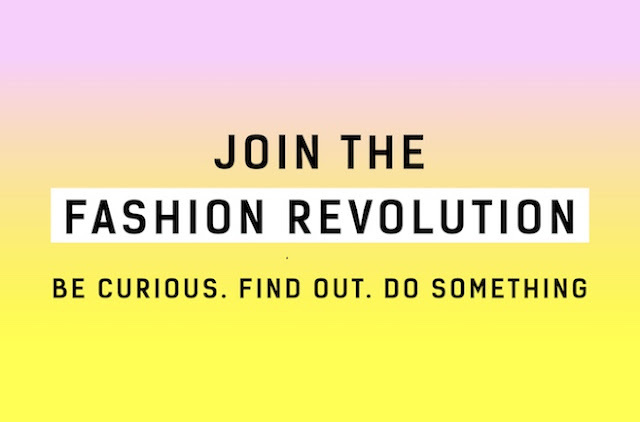 Join the Fashion Revolution this week and help change the world.